This page shows some of the sprayers referred-to in the DROPDATA pages. Obviously, we can only show here a very limited selection of the enormous range of available equipment. 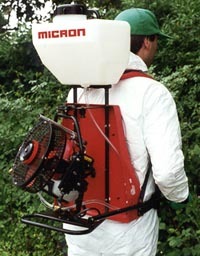 However, a large number of examples are housed at IPARC: one of the finest collections of portable pesticide application equipment in existence. Seed treatments, electrostatics, chemigation, etc. 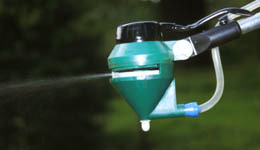 Most of the World's pesticides are mixed with water and sprayed through hydraulic nozzles: of one sort or another. There are enormous variations in the scale, the way pumping is achieved and the configurations of atomisers, but this >100 year old technology is still considered the method of choice, by most farmers and other spray operators. Large-scale tractor-mounted and self propelled equipment. The tailboom was designed to reduce contamination of cotton spray operators, and to improve delivery of insecticides to the undersides of leaves. 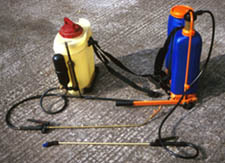 Sometimes, hydraulic sprayers are pumped remotely from the atomiser/lance: as with this hand pump, made by Aspee, India. Motorised mistblowers usually rely on air-shear atomisation, but they may be supplied (or retro-fitted) with rotary atomisers. 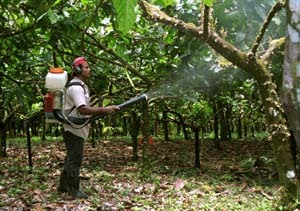 Motorised mistblowers were originally developed for spraying pests in tall trees such as cocoa capsids. 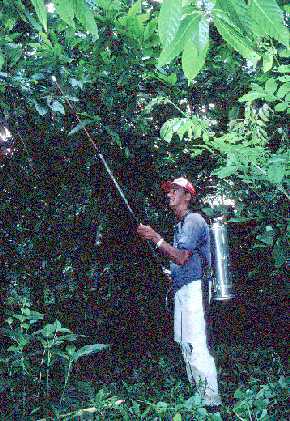 This illustration shows the Stihl SR400 in Costa Rica. 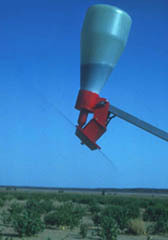 Mistblowers have also been used to improve horizontal throw and penetration into crops. 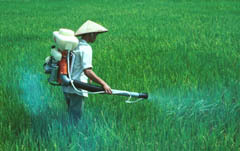 Here, a Kioritz DM9 is being used to apply a fungicide against rice sheath blight in Viet Nam. Rotary nozzles are normally used to achieve Controlled Droplet Application (CDA): the reliable way of applying pesticides at ultra-low volume (ULV) rates of application. Hand-held equipment is cheap and nowadays reliable: the Micron Sprayers 'Ulva+', with its predecessor: the 'Micro Ulva' (right). The Micron 'Motax' was developed with a number of collaborators, including staff from Cenicafé and IPARC, in order to improve fungicide and insecticide delivery and work rate in coffee. 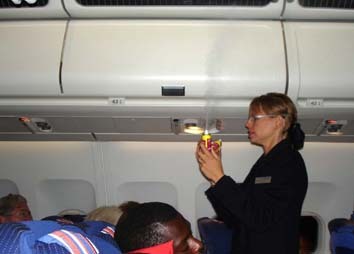 Photo Micron Ltd.
On a smaller scale, aerosol dispensers are familiar in domestic applications, but also used in public health: for example, for eliminating mosquitoes in aircraft. Granule application can be as simple as distributing the formulation to plant bases or central whorls with a (gloved) hand. 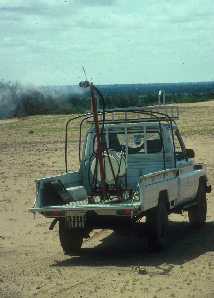 The use of a horn seeder, such as the Hudson model illustrated, can aid spreading, control flow and reduce operator contamination. Granular formulations are frequently prepared for toxic pesticides: but manual application equipment is not recommended for poisonous (especially class I) compounds. Tractor- mounted coulters for delivery of granules, fertilisers or seeds in rows. Although the dusting of crops is becoming less frequent, application equipment is still available: such as this hand duster, manufactured by Aspee. Apart from small-holder crops, dusts may be used for treating grain in stores. They also have a role where application equipment is unavailable (e.g. small scale grasshopper control). Dusts (DP formulations) are extremely small particles, liable to be inhaled and prone to be carried by the wind. Motorised mistblowers can also be adapted for application of dusts, but the strong airstream can create an even greater inhalation risk. The use of microgranule (MG) formulations can reduce this risk, but MGs are more expensive than DPs. Seed treatment represents one of the most efficient means of targeted application of pesticides. Commercial bulk mechanisms include: spraying onto conveyer belts, rotating perforated drums, seed coating (pelleting)and fluidised bed coating. 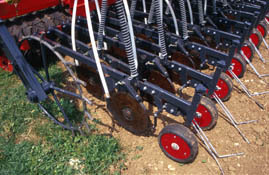 The pedal driven 'Rotosat' shown here is especially suitable for introducing the concept of seed treatment into remote areas. The selective use of seed treatments can protect seeds from early-season disease and insect pests affecting crop emergence and growth. Occasionally, seed treatments can be used to stimulate production over a longer term, using biological agents such as biopesticides and Rhizobium spp. (for nitrogen fixing).